Homespun Stitchworks..... For the love of vintage: Stitching vintage mermaids! I am having so much fun doodling and designing for my future projects. Having just got back from going to New England, I am all fired up with my sketch book from there. We did lots of beach combing in Cape Cod. The sea and the beaches are out of this world, with seals swimming about in the water. You can pick up shells and treasures of the sea just lying on the shoreline. I actually got some sand dollars, but I had to buy them as they need to be bleached other wise they smell dreadful apparently. So one of my new designs is with a mermaid. I am so pleased with my sketches that I have done. I will be stitching on vintage French linen and use embroidery, applique and a secret!! I will be looking at all the different embroidery stitches and deciding which ones to use. I have picked up a new batch of my hand dyed shaker threads and have some wonderful colours to use, I am thrilled. 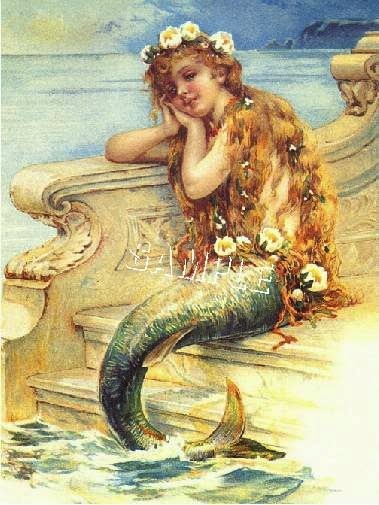 Mermaids are mysterious, magical and beautiful. The stories of them are sometimes destructive but they are always alluring sirens of the sea. There are lots of myths and stories surrounding them and I thought I would like to capture some of that beauty and make it into a beautiful bathroom picture. I may do two or three different ones to sell or go to publication. So watch this space. More tomorrow on other designs I will be doing. Beachcombing is my favourite holiday activity!! Me too Gill and whilst doing this in Cape Cod I was being watched by seals, who were taking it easy laying in the water!